Home › All About God › Is the God of the Qur’an the Same God as the God of the Bible? What is the difference between the Christian God and the Muslim God? Is the God of the Qur’an the same god as the God of the Bible? 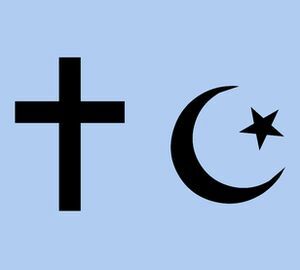 What is the difference between the Christian God and the Muslim God? If “Christianity” here means mainstream Catholic, Protestant, and Orthodox Christianity, it is necessary to understand that the fundamental Christian beliefs about God are not stated in the Bible itself, but were developed several centuries after the Bible was written. Historically, the doctrine of the Trinity of Persons was first developed by Tertullian in the third century (see “When in the development of trinitarian doctrine was the word “persons” first applied to God?” on Christianity StackExchange). It was first promulgated as official Christian doctrine in the fourth century in the form of the Nicene Creed, which was composed at the First Council of Nicaea in 325 AD. It achieved its full definition, accepted by the vast bulk of mainstream Christianity, a century or two later in the Athanasian Creed. It is necessary to understand, then, that the mainstream Christian understanding of God is not defined in the Bible itself, but rather in the Athanasian Creed. The Christian Bible itself never defines God as a Trinity of Persons. If “the Christian God” means “God as believed in by mainstream Christianity,” that God is quite different from the Muslim God. Islam, based on the Qur’an, focuses on and insists upon the complete oneness of God. Mainstream Christianity, while also stating that God is one, divides that oneness into three “Persons” of God, each of which has a distinct personality, attributes, and actions within the Godhead. Such a concept of God is contrary to the Qur’an’s insistence on the absolute oneness of God. Here it is useful to consider distinctly the Old Testament God and the New Testament God. While it is true that the Old Testament often speaks, in the context of the surrounding polytheism of the pagan world, as if the God of Israel were the greatest of the gods, and while it is true that polytheism did at times infect God’s people of Israel in the course of the Old Testament narrative, ultimately the Old Testament insists that God is one and there is no other God besides the one God, and that this one God encompasses all of the divine qualities: love, compassion, power, eternity, knowledge of all things, ability to save, and so on. In short, the God of the Old Testament is virtually indistinguishable from the God of the Qur’an. Yes, there are some cultural differences in wording and approach. But essentially, the God of the Old Testament and the God of the Qur’an are the very same God. Notice that it says “the glory as of a father’s only son.” This suggests that in line with Jesus’ own heavy use of parable and metaphor, the Gospels themselves use the terms “Father” and “Son” metaphorically to refer to different aspects or components of God rather than to speak of two distinct persons of God. While this may be debated by mainstream Christians, the fact is that the Bible itself never defines the Father, the Son, and the Holy Spirit as distinct “Persons” of God. Rather, it speaks of Jesus Christ as “God with us” (Matthew 1:22-23), and says that the Word (Greek logos), was with God, and was God, and that it became flesh and lived among us (John 1:1-5, 14, as quoted above). In the original Hebrew, the word for “I am” used here is very similar to the Tetragrammaton, or sacred name of the Lord, traditionally translated as “Jehovah.” The Hebrew text is here associating the name “Jehovah” or “Yahweh” with the verb “to be,” or “I am.” Therefore when Jesus said of himself, “before Abraham was, I am,” he was stating that he was the Lord and God of Israel—as his Jewish hearers clearly understood, given their response of attempting to stone him for blasphemy. Clearly the New Testament sees Jesus Christ as the human embodiment of the same God that is presented in the Old Testament. Regardless of historical debates among Christians about the precise nature of God, and regardless of the development of the doctrine of the Trinity of Persons by Christians in the third through the sixth centuries, the New Testament itself presents a picture of the one God, who is the Old Testament God, becoming flesh and living as a human being among human beings here on earth. The Qur’an sees God as one, and does not present God as becoming flesh and living among us here on earth. The Christian Bible sees God as one, and does present God as becoming flesh and living among us here on earth. Thanks for your comment. Yes, I remember Bruce Rogers saying that in class lo, these many years ago. Unfortunately, no published Bible translation that I can find has picked up on his simple brilliance in translating that famous verse.